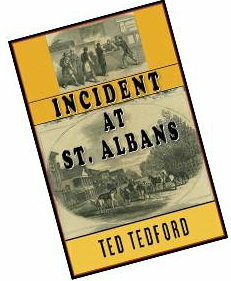 During the St. Albans Raid Commemoration this weekend, Underhill resident Ted Tedford will be releasing his new novel, Incident At Saint Albans, based on the life of Bennett Young. He will be reading from his works and signing books from 10-6, Saturday Sept 20th and Sunday Sept. 21st. There will also be copies of the new raid history available, The St. Albans Raid: Confederate Attack on Vermont by Michelle Arnosky Sherburne, Tom Weekley’s cd Rebels in Vermont!, and a reprint of Col. Bennett H. Young’s Secret History of the St. Albans Raid. There will be reading from civil war era novels, as well. Join us at The Eloquent Page, 70 North Main Street in St. Albans to help commemorate the St. Albans Raid! This entry was posted in Uncategorized by Donna Howard. Bookmark the permalink.